When Rangers won the 1984 Nigeria League, no one expected them to wait for another 32 years to get another. The stands were already one third full with about two hours before kick off. Within an hour, there were very few seats left with a lot of fans at the gate. Expectations were high and you wouldn’t expect less for a game with no gate fee. Elkanemi Warriors were the final visitors and they offered little opposition. Chisom Egbuchulam got his 1st hattrick of the game. He opened the goals galore in the 3rd minute from the spot and wrapped up proceedings in the 90th minute from the spot too. Unfortunately the hyperactive atmosphere was watered down by an unfortunate incident which resulted in the late penalty. In other centres, Rivers United secured the 2nd CAF Champions League slot with a 2-1 away win against Akwa United – their first win in Uyo since 2007. Wikki Tourists finished 3rd with a 2-0 victory over Sunshine Stars. Warri Wolves’ time in the NPFL came to an end despite a 1-0 win over Ikorodu United. MFM defeated FC IfeanyiUbah 1-0 but the inconclusive game between Plateau United and Heartland (1-1) leaves everyone waiting on the LMC for a final decision. Nervy. 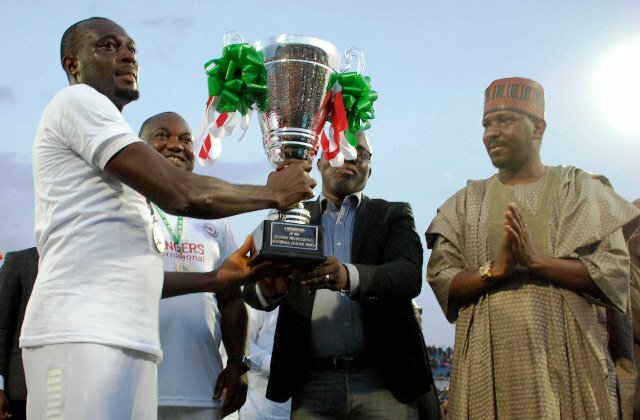 There it is, the end of the 2015/16 Nigeria Professional Football League. Congratulations to Rangers International of Enugu. As for Arsenal, they left it late as Chamberlain’s shot went off Koscielny for a late late winner. A 1-0 win well appreciated.